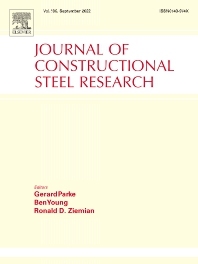 The Journal of Constructional Steel Research provides an international forum for the presentation and discussion of the latest developments in structural steel research and their applications. It is aimed not only at researchers but also at those likely to be most affected by research results, i.e. designers and fabricators. Original papers of a high standard dealing with all aspects of steel research including theoretical and experimental research on elements, assemblages, connection and material properties are considered for publication. Those presenting research findings in a form suitable for practical use are especially welcome. Papers reporting work in progress will also be included, provided the long-term practical implications of the research are evident, as will state-of-the-art papers, or those by designers and fabricators dealing with issues bearing directly on research. The journal will also present technical notes, book reviews, discussions and letters to the Editor. It is intended that at intervals summaries will be included indicating current research activities throughout the world, and reports of conferences and meetings related specifically to constructional steelwork. Announcements of conference and symposia are also included in the form of a calendar.